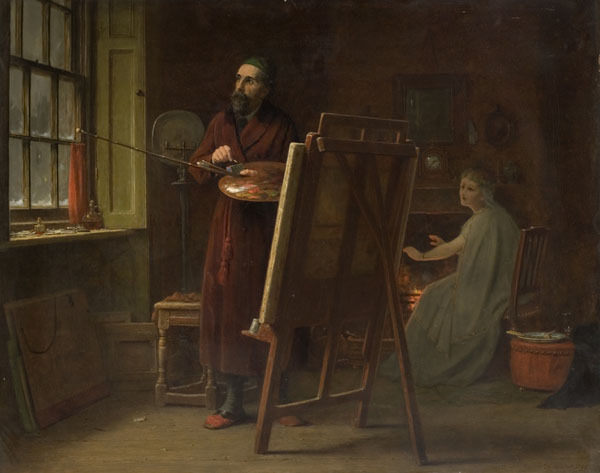 Summary: Oil painting showing a painter standing at his easel holding a palette, gazing out of the window. A woman sits by the fire warming herself. 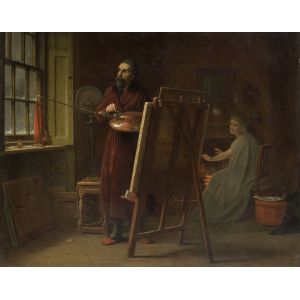 Description: A painter stands at his easel; he is looking out of the window. In the background, a woman, perhaps his model, is sitting warming herself in front of the fire. Although he did not attend the Royal Academy Schools, nor did he travel like his brother, Frederick is considered the most prominent member of the Cranbrook Colony.